Daily Deals: A Life in Stitches, Unglued, Monster and Witches’ Brew – Halloween potion making fun! In these 20 heartfelt essays, Rachael Herron celebrated romance novelist by day, 911 dispatcher by night, shows how when life unravels there is always a way to knit it back together again, many times into something even better. Honest, funny, and full of warmth, Herron s tales, each inspired by something she knit or something knit for her, will speak to anyone who has ever picked up a pair of needles. From her very first sweater (a hilarious disaster, to say the least) to the yellow afghan that caused a breakup (and, ultimately, a breakthrough), every piece has a moving story behind it. This beautifully crafted and candid collection is perfect for the knitter who loves to read and the reader who loves to knit. Rachael Herron is the creator of Yarnagogo.com, which receives over 90,000 hits a month, and the author of the novel How to Knit a Love Song. She lives with her better half in Oakland, California. 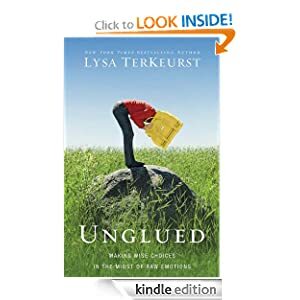 Unglued: Making Wise Choices in the Midst of Raw Emotions by Lysa TerKeurst is the second book in today’s deal pack. It costs $1.99. Lysa TerKeurst is a New York Times bestselling author and national speaker who helps everyday women live an adventure of faith. She is the president of Proverbs 31 Ministries, author of 15 books, and encourages nearly 500,000 women worldwide through a daily online devotional. Her remarkable life story has captured audiences across America, including appearances on Oprah and Good Morning America. She lives in North Carolina with her husband and five children. SPANISH BIO: Lysa Terkeurst es autora de doce libros (incluyendo la Medalla de Oro como finalista y el premio People Choice Award) asi como numerosos articulos en revistas. Ella ha contado la extraordinaria historia de su vida en television y radio nacionalmente, incluyendo el show de Oprah y Good Morning America. Reside en Carolina del Norte con su esposo y cinco hijos. 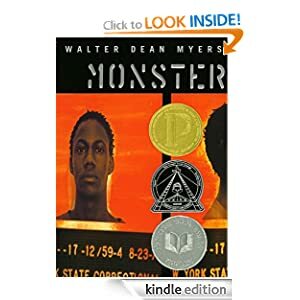 Monster by Walter Dean Myers is book for young readers with special price $1.99. Walter Dean Myers is the National Ambassador for Young People’s Literature, New York Times bestselling author of Monster, and winner of the first Michael L. Printz Award. The critically acclaimed author of Kick, Lockdown, Dope Sick, Game, Street Love, The Autobiography of My Dead Brother, Handbook for Boys, and Bad Boy, he is considered one of the preeminent writers for children. Walter’s novel shooter is the inspiration for the film Case 219. His latest picture-book collaboration with his son, Christopher Myers, We Are America: A Tribute from the Heart, is a love letter to the United States that reimagines what it means to be an American. Visit www.who-is-america.com to find out more! Walter lives in Jersey City, New Jersey, with his family. Witches’ Brew – Halloween potion making fun! is a small game which is free today only. Witches’ Brew offers action-packed Halloween fun for the whole family. In this game, you’ll help the funniest witch you have ever seen collect the correct ingredients for her spells. But make sure you avoid touching the mushroom and the voodoo doll while you master all the potions. 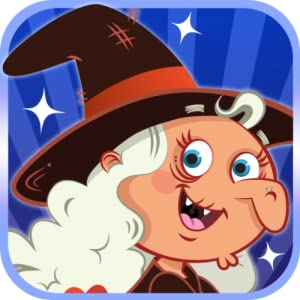 Witches’ Brew includes a physics-enabled collision system, a cinematic soundtrack, funny animations, HD graphics, easy tilt control gameplay, two difficulty settings, 100 levels….that’s one witchin’ app! 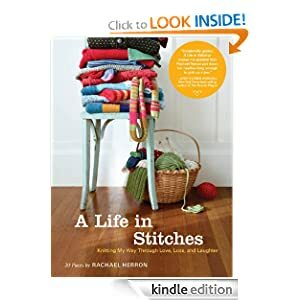 This entry was posted in Kindle Applications, Kindle Apps, Kindle Books, Kindle Daily Deal and tagged A Life in Stitches, Lysa TerKeurst, Monster, Rachael Herron, Unglued, Walter Dean Myers, Witches' Brew - Halloween potion making fun! by Paul. Bookmark the permalink.